I don’t know if these beauties are relatively new or if I simply have not noticed them before. Gluten free chocolate chip cookies? Don’t mind if I do! We opened the bag tonight and everyone in the family got to sample it. Taste: Buttery deliciousness! The first thing I tasted when I took a bite was the taste of butter. It was not overwhelming but definitely noticeable. These cookies taste like the real thing, because they are the real thing, with few basic real ingredients. Everyone loved them. V proclaimed them the best cookies she ever had in her life (probably because it’s been a while since she had “real” cookies). My son gobbled them up. My husband loved the crispy texture and said this is exactly how he likes his cookies. Please note that ingredients include soy, eggs and milk. Texture/Consistency: Crunchy and crispy. 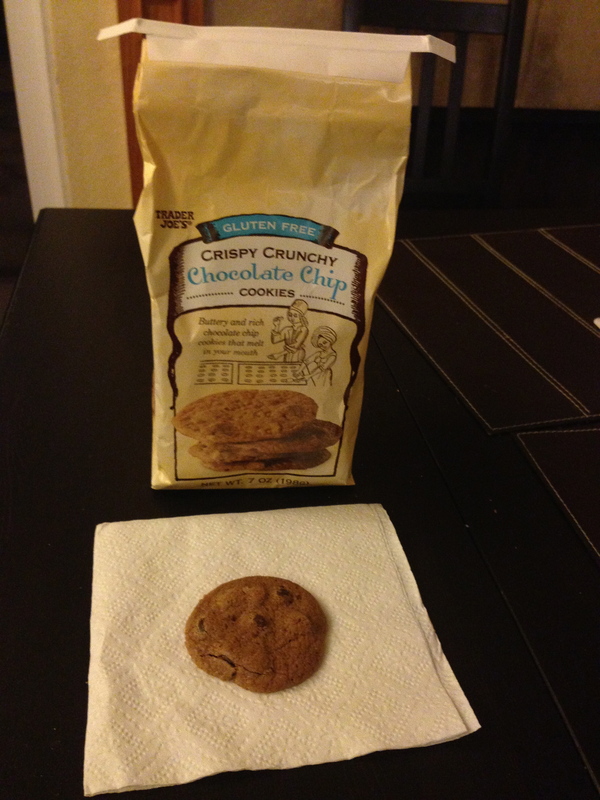 They are a little thinner than regular gluten-free cookies but otherwise you would not be able to tell the difference. Carbs: One serving is two cookies, for the bargain carb count of 18 g. Not bad at all. Accessibility and price: Found these in our local Trader Joe’s. I do not know if they are available at other locations. Price is $3.99 for the 7 oz bag containing 14 cookies. Pretty standard for GF faire, though of course expensive compared to regular cookies. Bottom line: Great in taste, lower in carbs, delightful treat! We will definitely be buying more and I will need to figure out how to keep them away from my husband, who is fast developing a taste for gluten-free food. V had an overnight at my parents’ house and was not feeling well today. (She had to stay up until 10:30 PM last night to check her bedtime sugar, since she had a late desert but my Mom can’t quite check blood sugar and/or administer insulin when V’s asleep. As a result she was tired and off today.) She did not have much of an appetite. In fact, she did not want to eat until later in the afternoon, so had no breakfast and no lunch. A couple of months ago it would have been a nerve-wrecking disaster worrying about her dropping, and having to call MD on call to figure out what changes she had to make to her insulin regimen. But with our current system it was simple. Check blood sugar to make sure it was not low. Done. No food = no insulin. Simple. She actually had perfect numbers throughout the day. In other news, I hate malt. Or rather I hate that malt flavor is added to virtually every breakfast cereal that would be gluten-free otherwise. It is so damn hard to find gluten-free cereal that does not cost $5 for a tiny box. Costco used to carry Honey Chex and Panda Cereal. While they were rather higher in carbs and sugar than I’d prefer, at least they were affordable options. I haven’t seen them last few times I’ve been there. So now I’m back to looking for coupons and waiting for sales. End of rant. On the upside, three cheers to Mountain Mike’s Pizza! V loves their gluten-free pizza and the rest of the family loves the regular pizza. And it’s just a mile away from home, making it an easy carry-out. We have not been able to get nutritional info for gluten-free pizza but so far our estimates seem pretty accurate judging by blood sugar numbers. Win.